Wassup! : Is the US becoming the next England? As in, moving from the most powerful nation in the world to a much less dominate and influential nation? 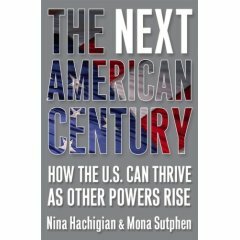 Well, the writing's on the wall if we keep going in the direction we are, according to authors Mona Sutphen and Nina Hachingian, who wrote The Next American Century: How the U.S. Can Thrive as Other Powers Rise. Something that cut England's entrenched "first place" in the world is that it did not maintain a strong educational system. So when the rest of the world became more science-based in economic innovation, Great Britain was caught flat-footed. Today American students rate somewhere between 25-35 among some 57 nations when it comes to math and science scores, which is an indication of a failing school system. The US is seen as a place that is more difficult to work for scientific innovation because of its conservative government's interference and actual misfeasance when it comes to scientific reports and other research. Imagine being an internationally renown scientist who wishes to develop new and improved research on vital subjects, interests or diseases, only to be confronted with where they stand on irrelevant conflicts over Creationism, Intelligent Design and evolution. Um, better to go to other future-thinking nations that not only support scientific research economically, but are free of constraints, restraints of ideological conformity. Innovation is the key to the US remaining #1 - as well as having an attitude of not being threatened by other nations such as China and India, that used to be considered poor, who are coming into their own now. From whom, in fact, the Bush adminstration has borrowed *many* billions of dollars to support the war in Iraq. Keeping an eye on the prize of continuing to stimulate innovation and build the nation's infrastructure while maintaining national strength through strong employment, moving away from oil as a primary source of energy - and of course national security. The failure of the US to provide universal health coverage for its citizens is actually a primary reason that innovation can be stymied because many innovators have chosen to remain in corporate or passive jobs because they don't have or can't afford health insurance if they leave those jobs. If universal health care were provided, entreprenurial types could leave those passive jobs and pursue creative, innovative products and services that could make a significant difference in our economy - nationally and internationally. Working toward the international legal protection of intellectual property must also take place worldwide; that's a challenge when some nations have very poor legal systems. Dealing scientifically and innovatively with climate crisis issues will also make a big difference as well as understanding that the threats of a pandemic disease and "bioweapons" are more serious than the generalized threat of terrorists striking the homeland. In short, take better care of ourselves at home - health care, education, roads, innovation, transportation, employment, economy, environment, communication - and we can automatically take better care of ourselves internationally. Meanwhile, the so called "living standard" of Great Britain (economically, socially) *just* surpassed the US for the first time in many many many decades. To those who care about healing the nation: tick tick tick. Get smart. Get educated. Love and get loved. Stay healthy. Stay strong. Stay positive.